The Public Ledger was a daily newspaper in Philadelphia, Pennsylvania, published from March 25, 1836 to January 1942. Its motto was "Virtue Liberty and Independence". For a time, it was Philadelphia's most popular newspaper, but circulation declined in the mid-1930s. It also operated a syndicate, the Ledger Syndicate, from 1915 until 1946. Founded by William Moseley Swain, Arunah S. Abell, and Azariah H. Simmons, and edited by Swain, the Public Ledger was the first penny paper in Philadelphia. At that time most papers sold for five cents (equal to $1.14 today) or more, a relatively high price which limited their appeal to only the reasonably well-off. Swain and Abell drew on the success of the New York Herald, one of the first penny papers and decided to use a one cent cover price to appeal to a broad audience. 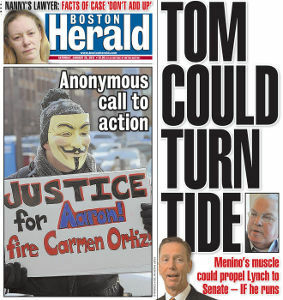 They mimicked the Herald's use of bold headlines to draw sales. The formula was a success and the Ledger posted a circulation of 15,000 in 1840, growing to 40,000 a decade later. To put this into perspective, the entire circulation of all newspapers in Philadelphia was estimated at only 8,000 when the Ledger was founded. By the early 1860s, The Ledger was a money-losing operation, squeezed by rising paper and printing costs. It had lost circulation by supporting the Copperhead Policy of opposing the American Civil War and advocating an immediate peace settlement with the Confederate States of America. Most readers in Philadelphia at the time supported the Union, although there was a strong contingent of Southern sympathizers and families with ties to the South, as Southerners had long had second homes in Philadelphia and sent their daughters to finishing schools there. In the face of declining circulation, publishers were reluctant to increase the one-cent subscription cost, although it was needed to cover the costs of production. In December 1864, the paper was sold to George William Childs and Anthony J. Drexel for a reported $20,000 (equal to $320,383 today). There is an element about some poetry which is able to make even physical suffering and death cheerful things to contemplate and consummations to be desired. In 1913, Cyrus H. K. Curtis purchased the paper from Ochs for $2 million and hired his step son-in-law John Charles Martin as editor. Curtis was owner of the magazines, Ladies' Home Journal and The Saturday Evening Post. His intention was to establish the Ledger as Philadelphia's premier newspaper, which he achieved by buying and closing several competing papers: the Philadelphia Evening Telegraph, the Philadelphia North American, and The Philadelphia Press among them. Philadelphia went from a peak of 13 papers in 1900 to seven in 1920, a time when the newspaper industry in the United States was consolidating in general. 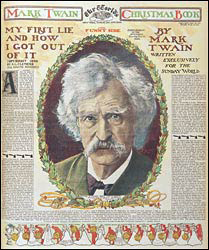 Under Curtis' ownership, the conservative appearance of the Ledger was increased: it avoided bold headlines and seldom printed photographs on the front page. Its conservative format has been compared by scholars to the Wall Street Journal or New York Times of the twentieth century. Curtis built the Ledger's foreign news service and syndicated it to other papers via his Ledger Syndicate. From 1918 to 1921, former President William Howard Taft was on staff as an editorial contributor. To broaden the market, and compete against The Evening Bulletin, in 1914 Curtis began publishing the Evening Public Ledger, a bolder paper designed to appeal to a broader public. The Ledger suffered by competition from an ascendant The Evening Bulletin, which under publisher William L. McLean grew in size from 12 pages in 1900 to 28 pages in 1920, and from circulation of 6,000 to a leadership position of over 500,000 readers in the same time. The Bulletin's bolder and more commercial approach attracted additional advertising, which in turn drew more readers. Advertising, which comprised only 1/3 of the Bulletin in 1900, grew to nearly 3/4 of its pages in 1920. At the same time, the circulation at the Ledger stagnated. Curtis built a new Public Ledger Building in 1924 on the same site as the old, designed in the Georgian Revival style by Horace Trumbauer. In 1931 Ledger reporter Hubert Renfro Knickerbocker received a Pulitzer Prize for correspondents for a series of articles on the Five Year Plan in the Soviet Union. ^ Rottenberg, Dan (2006). The Man Who Made Wall Street. Philadelphia: University of Pennsylvania Press. p. 73. ISBN 9780812219661. Retrieved 6 June 2009. ^ "Post-Mortem Poetry". Twainquotes.com. Retrieved 2014-01-04. ^ Klein, Philip; Hoogenboom, Ari (1973). A History of Pennsylvania. Penn State Press. Retrieved 6 June 2009. ^ a b c d Hepp, John Henry (2003). The Middle Class City. Philadelphia, PA: University of Pennsylvania Press. pp. 130–131. ISBN 9780812237238. ^ Jenkins, Philip (1997). Hoods and Shirts: The Extreme Right in Pennsylvania, 1925-1950. UNC Press. p. 114. ISBN 0-8078-2316-3. ^ Brennan, Elizabeth A; Elizabeth C. Clarage (1999). Who's who of Pulitzer Prize winners. Greenwood Publishing Group. p. 71. ISBN 9781573561112. Retrieved 10 June 2009. ^ Fischer, Heinz-Dietrich; Erika J. Fischer. The Pulitzer Prize archive: a history and anthology of award-winning materials in journalism, letters, and arts. Munich: Walter de Gruyter. p. 68. ISBN 9783598301704. Retrieved 10 June 2009. Wikimedia Commons has media related to Public Ledger (Philadelphia). "Muckle, Mark Richards" . The Cyclopædia of American Biography. 1918. Muckle was business manager of the Public Ledger about 50 years. Arunah Shepherdson Abell was an American publisher and philanthropist from New England who was active in Pennsylvania and Maryland. Born in East Providence, Rhode Island, Abell learned the newspaper business as an apprentice at the Providence Patriot. After stints with newspapers in Boston and New York City, he co-founded the Public Ledger in Philadelphia and later independently founded The Sun of Baltimore, Maryland; both were penny papers to appeal to the working class. Abell and his descendants continued ownership of The Sun as a family business until 1910. The Record is a newspaper in North Jersey, United States. It primarily serves Bergen County, though it also covers Hudson, Essex and Passaic counties as well. It has the second largest circulation of New Jersey's daily newspapers, behind The Star-Ledger. The Birmingham News is the principal newspaper for Birmingham, Alabama, United States, and the 3-day newspaper in Alabama. The paper is owned by Advance Publications, and was a daily newspaper from its founding through September 30, 2012. The next day, the News and its two sister Alabama newspapers, the Press-Register in Mobile and The Huntsville Times, moved to a thrice-weekly print-edition publication schedule. The Times-Picayune of New Orleans, also an Advance newspaper, also went to thrice-weekly on the same day. The Philadelphia Evening Telegraph was a newspaper published in Philadelphia, Pennsylvania, from 1864 to 1918. The General Pershing WWI casualty list was a list of casualties released to the media by the American military during World War I. Newspapers like the Evening Public Ledger would title the list's summary, General Pershing Reports or Pershing Reports. The name General Pershing refers to General John Pershing who was in command of the American Expeditionary Forces (AEF) the expeditionary force of the United States Army during World War I. While fighting the Germans on the Western Front the AEF would take daily casualties in the form of those killed in action (KIA), those who died from their wounds, those who died from disease, accidental deaths, soldiers missing in action (MIA) and soldiers wounded in action (WIA). These numbers would be tabulated by the American military and then released to the American news media. Much after the war the real numbers were mined from the military bureaucracy as opposed to the fog of war. During WWI 4,734,991 served in the American military. There were a total of 116,516 deaths with 53,402 of those in battle. Another 63,114 died in accidental deaths but around 45,000 died due to the 1918 Spanish Flu outbreak. Of those that survived the war 204,002 were wounded in some way.